Yes I am trading thoughtful (or merely time-consuming for me) posts for an end of the year book list. It’s not a top ten, and I do not have a “read of the year.” These are the books that lingered in my mind past the initial reading and were the ones I couldn’t put down. – From his pseudonym Johannes Climacus, Kierkegaard explores the concept of faith. He examines Abraham’s obedience and willingness to sacrifice Isaac as a tool to explore the internal process of making an obedient decision out of faith. Here he deploys his famous analogy of the Knight of Infinite Resignation vs. the Knight of Faith. Making the topic more interesting, Kierkegaard’s seems to use his analysis as a way of coming to grips with his own personal failure of letting his beloved, Regine Olson, slip through his fingers. – The third installment in Wright’s Christian Origins and the Question of God Series packs a punch for anyone interested in studying the topic of Resurrection and/or afterlife. He takes us culture by culture, thinker by thinker, philosophy by philosophy, examining what each people group thought of in terms of resurrection, afterlife, death, etc. Wright does this to set up a historical understanding of the concept in order to fully comprehend what Christians meant when they used the term in the New Testament. He then proceeds to argue that the best explanation for these Christian writings and the Christian movement, was a historical bodily Resurrection. This book is also helpful because Wright accurately critiques the all-too common unbiblical Platonic and Cartesian views of heaven present in many evangelical churches today. A “must-read” if you’re ready for 750 pages on the topic. 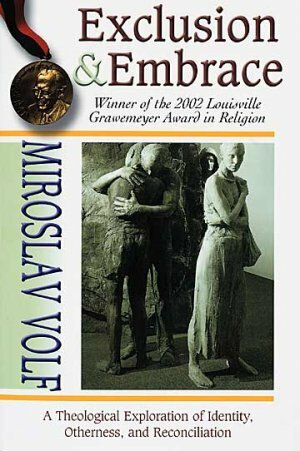 – Volf’s Exclusion and Embrace might be my book of the year. The book explores ideas of conflict, conflict resolution, reconciliation, forgiveness, justice, and evil all in relation to the cross. He skillfully critiques modernity and postmodernity’s attempts at deciding what we’re supposed to do with evil and atrocities in the world in favor of a Biblical view. An excellent read and a good way to brush up on post-modern thinking. -Yes another NT Wright book made my list. This book is highly influenced by Volf’s Exclusion and Embrace but more directly tries to answer the “Problem of Evil.” He attempts to present a Biblical Model and answer that is both enlightening and challenging. Wright’s handling of the problem will not satisfy all, but is a refreshing departure from the usual defenses and arguments presented in favor of Christianity. Like Wright’s other material, he astutely emphasizes the complete meta-narrative of scripture enabling us to see the problem, and the picture more clearly. – Tim Keller released an excellent little book on the topic of justice. This was one of the more refreshing reads as Keller is an unashamed evangelical whose passion for evangelism and social justice are evident in all his writing. He effectively articulates God’s concern for the poor, making any theology omitting the poor, fallacious theology. Many books that address the issue of social justice come from the perspective of a more liberal-minded theology, Keller breaks that trend providing a breath of fresh air for those who feel that evangelicalism in the United States lacks passion in that arena. A short, but great read. – An excellent read in the field of Biblical Studies regarding eyewitness testimony in the ancient world and specifically in the Gospels. While the book’s scope is broad, my favorite sections are Bauckham demonstrates the Bible’s internal textual evidence regarding the witnesses behind particular stories. His section on the eyewitness testimony of women in the Gospel of Luke is of particular interest. I had other good reads this year, but these are the highlights. In an effort to protect myself from Theological McCarthyism, I offer this disclaimer. While I would highly recommend any of these books, I do not endorse all the ideas conveyed by the authors. Guilty Pleasure of the Year: The Hunger Games trilogy: heck, I started the books and couldn’t put them down.